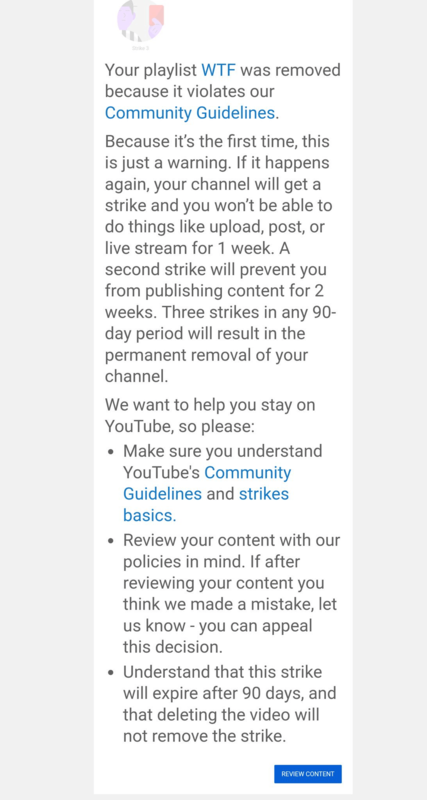 The video streaming giant YouTube is now giving community guidelines strikes to users for creating playlists, even if these playlists contain no videos from the YouTube creator receiving the strike. If you’re not familiar with the playlists feature, it allows users to compile a list of YouTube videos which can then be viewed privately by the user or displayed publicly on their channel. This new type of community guidelines strike means YouTube creators could potentially get their channels terminated for simply putting together lists of videos from other users that feature none of their own content. 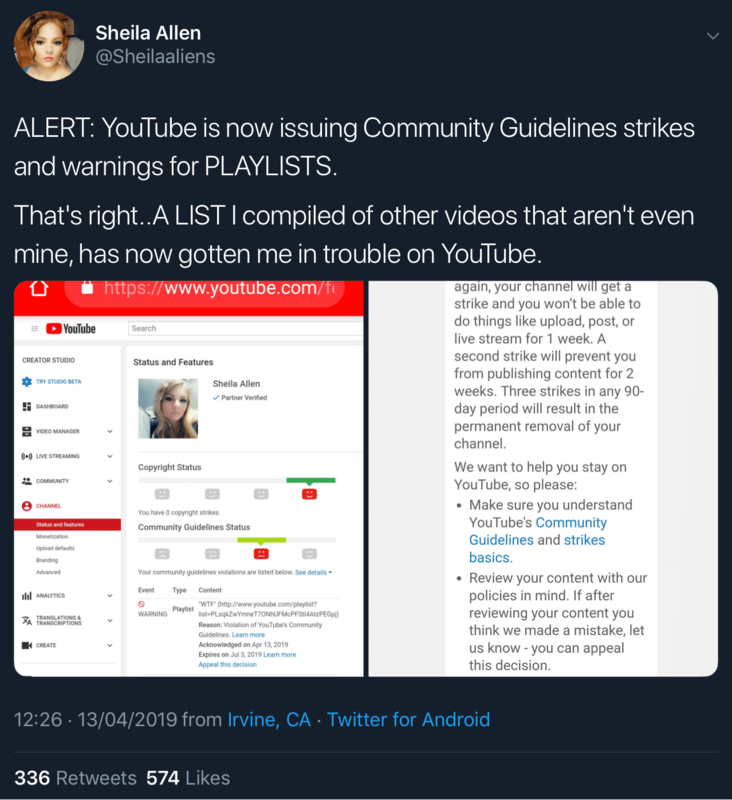 YouTuber Sheila Allen broke the news of this new type of community guidelines strike on Twitter when she received a warning on one of her playlists which she claims contained none of her videos. It’s not clear why YouTube has started issuing community guidelines strikes against playlists. However, Allen did suggest that her warning could be related to the content of the videos in her playlist. Allen says she was flagging videos with inappropriate comments aimed at minors to YouTube and then using this playlist to keep track of the videos she’d flagged. YouTube infamously responded to the types of videos that Allen was adding to her playlist by demonetizing the videos if they contained inappropriate comments and mass disabling comments on videos featuring minors. It’s possible these new community guidelines strikes against playlists could be another misguided attempt to crack down on these inappropriate comments while primarily hurting creators who do nothing wrong. 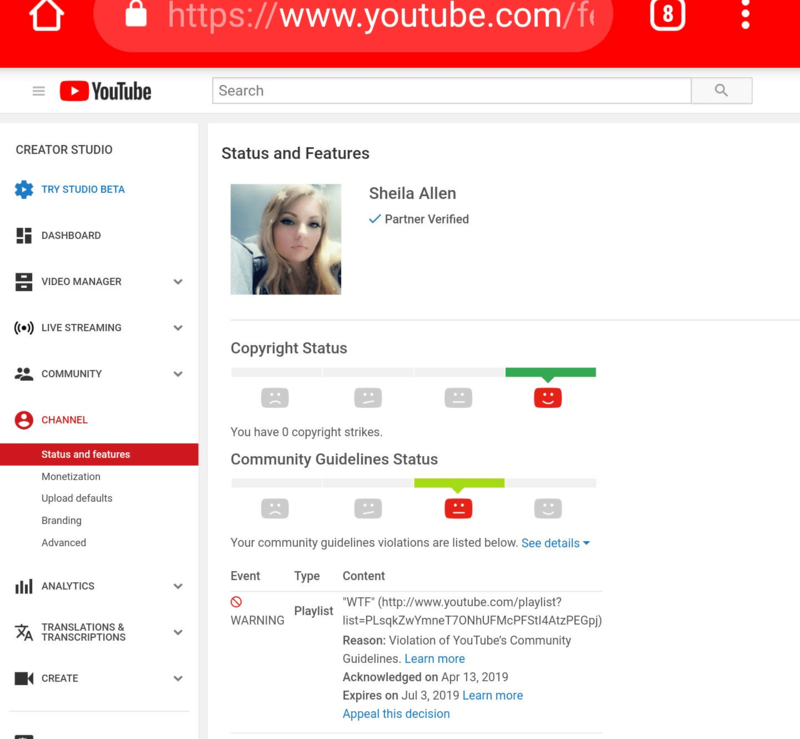 Since this is the first time Allen has violated YouTube’s community guidelines, she received a warning and the playlist was removed but no other penalties have been levied against her account. However, if YouTube decides any of her other playlists violate its rules, she will start to receive community guidelines strikes which will limit her ability to upload and live stream and could even lead to her account being deleted. This is a worrying update for YouTube creators because it means that creating playlists of videos from other creators is now all that it takes to get their channel frozen or deleted. Instead of having their channels judged based on the content they produce, creators are once again being punished for content that’s beyond their control. What is a VPN app and why do you need one?